I didn't feel any real attachment to any of the characters. I know that the proper polite manner is necessary to convey time and place but it also made the characters, particularly that of Vale, feel very wooden to me. I simply couldn't relate with them at all and because of that, found I didn't really care what happened to them. Even the big revelation about Vale's true identity didn't have the impact that it should have because of the disconnect. On one hand, I'm supposed to be scared of Vale and his terrible awesomeness yet on the other, he never seemed to really follow through with his power and spent most of time following Irene around. Irene's main nemesis is Alberich and we are told how powerful he is. Part of his power comes from the fact that so little is known about him. There's this incredible amount of build up about the threat he poses and yet he's easily dispatched by Irene. It felt like a huge let down. I did however like the idea that Alberich is part of a fairy tale and that the truth of his story is scarier than fiction. This should have been explored so more than it was. Bradamant is the only other female character of note in this story and she is a fellow Librarian. I know that being the same gender as another doesn't necessarily breed anything other than contempt but I do however find it telling that Cogman only focused on two female characters and they loathed each other. Throughout The Invisible Library, Bradamant did her best to sabotage Irene out of jealousy. Irene had what Bradamant never did - a loving family who raised her to be a Librarian. That's it. That's all it took to set two women against each other. I suppose I should be thankful that the beef isn't over a man. The only character of colour to get any real time on the page is Inspector Singh. Because Irene has to keep her activities secret, Singh spends most of the book on the outside looking in, making their interactions somewhat adversarial. That being said, Cogman didn't really invest in Singh and so not much time was spent making him familiar. There were no LGBT characters in The Invisible Library. This is quite commonplace in steampunk novels. For whatever reason, authors seem to think that LGBT people didn't exist during the Industrial Revolution when nothing could be further from the truth. 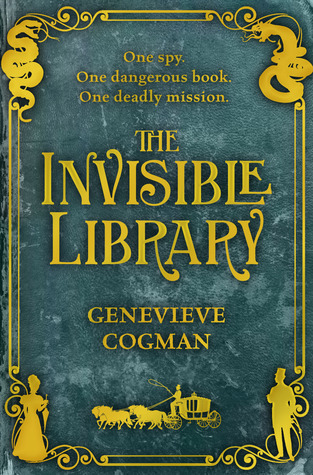 I love a good steampunk novel and The Invisible Library just doesn't fall into that category. It's extremely over written and Cogman never chooses one word when she can use two. The descriptions of London itself were extremely repetitive and read as though she Cogman was attempting to teach history to an ignorant child. I never became connected with character and consequently, didn't really care what happened to them. The character felt stiff and borrowed from elsewhere, with Irene in particular reading like a self insert. I don't know how I made it through this book, given how many times I was tempted to DNF it.